All future matching will happen against enrolled fingerprints. Hence it is very important that the enrollment template is of high quality. Many biometric projects fail because users are not being identified correctly during daily use. Selecting the right fingerprint reader is a very important step. 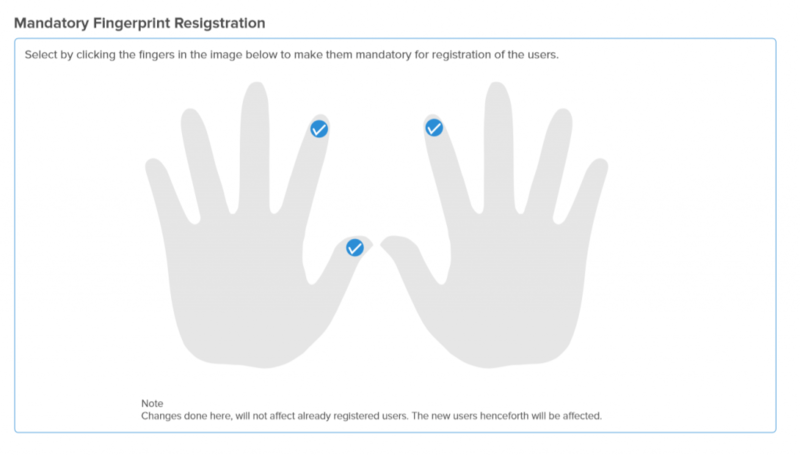 If the biometric scanner that you are using for registration cannot take the best images then the whole system will fail as you will end up registering bad quality fingerprints. Your biometric database will contain substandard fingerprints. Selecting the best fingerprint reader is discussed in my previous blog post. I can understand that best fingerprint scanners are expensive and might not always fall in budget. If that is the case then you can use high end fingerprint scanners for registration and low end fingerprint scanners for matching. To get the best fingerprint images, the finger should be placed directly on the finger scanning area of the fingerprint sensor. Usually the tip of the finger is at the top of the finger sensing area and the finger is centered from left to right. For the best quality images, fingers should be placed such that a maximum area of the fingerprint is imaged. Generally this means that the first knuckle of the finger is at the bottom of the platen and the fingertip is at the top, with the finger centered on the platen from left to right. During registration of fingerprints, capture multiple images of the same finger to create a consolidated fingerprint template. More fingerprint samples means the fingerprint scanner software or fingerprint algorithm has more minutiae points to create a very good fingerprint template. Tip: Please ensure that when you are capturing multiple images of the same finger, the user lifts their finger and places it again on the scanner between each capture. The advantage of capturing multiple images of the same finger is eliminated when the finger is not lifted between each capture. Incorporate fingerprint quality check in your fingerprint capture process. Ensure that you only use the best quality fingerprints to create the fingerprint template. You can discard fingerprint images that are not so good. This might increase your registration time by few seconds but it is definitely worth it and will saves tremendous amount of time to users during day to day use. Performance of biometric systems is dependent on the quality of the acquired input samples. If quality can be improved, either by sensor design, by user interface design, or by standards compliance, better performance can be realized. For those aspects of quality that cannot be designed-in, an ability to analyze the quality of a live sample is needed. This is useful for the real-time selection of the best sample, and the selective invocation of different processing methods. It is the key component in quality assurance management. Tip: You can do fingerprint image quality check using NIST Fingerprint Image Quality algorithm (NFIQ). Capturing multiple fingerprints ensures that there is a backup in case of injury. Also, if user is having trouble being identified via their index finger, they can use alternate finger. Rolled fingerprints capture more minutiae and larger fingerprint area ensuring that the template has lots of fingerprint data points. You can consider using rolled fingerprints for registration. Every Fingerprint software has a pre-defined fingerprint matching threshold. It is highly unlikely that 2 fingerprint minutiae templates acquired from same finger at different sessions will be 100% exact match. Hence during fingerprint matching, the fingerprint software compares 2 fingerprint templates and returns a match score. If the match score is higher than the predefined match threshold then the input template is said to have successfully matched with the stored template. If the match threshold is set too high then you will be have high False Rejections. If the match threshold is is too low then we will have high False Acceptance (BTW: we never want this). It is important to adjust the fingerprint matching Threshold based on your application. For example, Biometric Attendance Software does not require the same threshold as Biometric Banking Software. The false acceptance rate, or FAR, is the measure of the likelihood that the biometric security system will incorrectly accept an access attempt by an unauthorized user. The false rejection rate, or FRR, is the measure of the likelihood that the biometric security system will incorrectly reject an access attempt by an authorized user. Talk to us to find out how Touch N Go ensures Best Fingerprints enrollment.